Discussion in 'General Attire & Accoutrements' started by herringbonekid, Jan 3, 2006.
i used to work in a vintage clothing shop. this crop-haired girl sometimes came in. she didn't even look at the women's clothes. she went straight to the men's section and would buy trousers, shirts and sweaters. she had good taste too. and no, she wasn't fat and ugly. she was exquisitely pretty. and somehow the male clothing only accentuated that. Stormy and HatLoverGirl like this. Furrowson and MisterCairo like this. The second look down is one of my favorites ever. I wore something very similar on the Queen Mary. I believe that Katherine Hepburn, quite an exquisite woman, had clothing that was based on mens suits. As seen in "The Aviator", Hepburn's character played by Kate Blanchett, wore a few outfits that were modeled after mens suits. 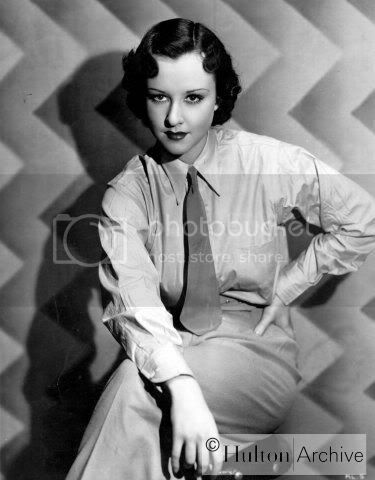 Her golf outfit for example, although velvet, was modled more like a mans suit than a woman's play outfit. Unfortunatley her outfits and love of sport lead to some rumors about her, that have been disproved. In all the pictures I have seen of her dressed like this she still looked amazing. If a woman carries herself like a woman, she can wear anything and still look beautiful (well, this probably might not apply to some of the not so beautiful modern styles). in 30s sears catalogues they even called certain styles 'man-tailored'. In 1920s Paris, the "garconne" look was very popular for women. So was lesbianism. Coincidence? i think the flapper look was considered boyish compared to what had gone before. it was hardly masculine, especially by today's standards. if you're suggesting that every woman who had her hair bobbed or wore the latest mannish suit was a lesbian then i think you've got quite an imagination. OK, this might be a very far stretch, but the 19th ammendment, the woman's right to vote passed in 1920. Although it began in the mid 1800's, in the early part of the 20th century, the women's sufferage movement was really trying to take a stand. As we know, clothes often reflect the times. I have seen the clothing catalogs from the 20's and 30's and a lot of them feature "mens tailored suits" for woman. I wonder if this new styling, along with more and more woman wearing pants, was a reflection of these women's fight. Unfortunately woman were often criticized for dressing like men, called lesbians. Once again, Katherine Hepburn is a good example, even though she presented herself as a feminine starlett! ...but a guy wearing women's clothes is a weirdo. 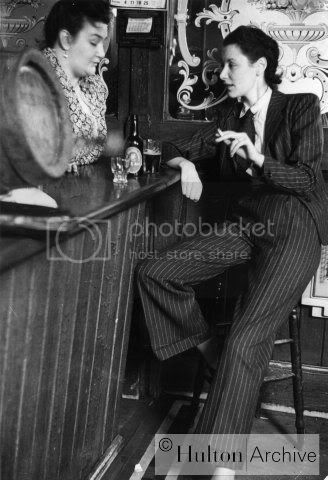 Unfortunately woman were often criticized for dressing like men, called lesbians. In America, you mean. In Paris, at least, being called a lesbian wasn't considered insulting. At worst, "lesbians" were seen as a greater challenge for Frenchmen-about-town. Suffragettes did not wear pants. Their suits, boxy and practical, still had skirts, and could never be mistaken for menswear. 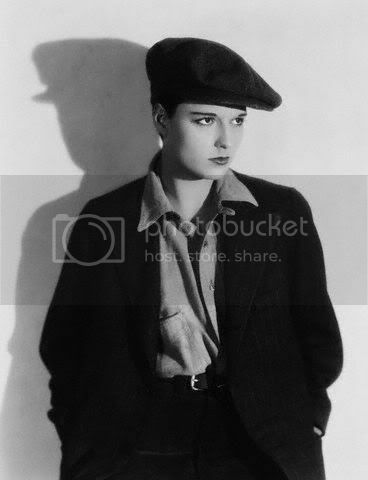 In contrast, such Parisian lesbians as Renee Vivien, Natalie Barney, Romaine Brooks and Dolly Wilde (Oscar's niece) had the wealth and/or social connections to promote their very mannish style of dressing. Barney's "Sapphic salons" were the talk of 1920s Paris: her female guests wore neckties, trousers and monocles. Coco Chanel herself was inspired by them. Women's clothing became less ornamental and constricting as their owners entered the workplace and the golf links. 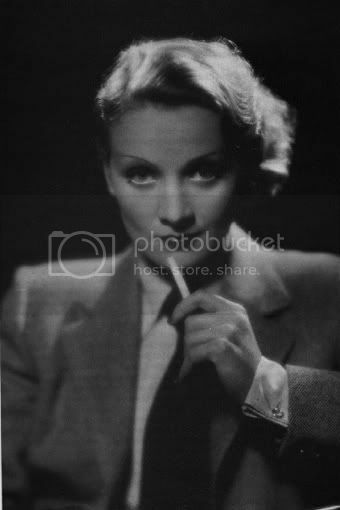 But it was "lesbian chic" that led to the extremely mannish suits worn by Marlene Dietrich and Katherine Hepburn. I still contend that the sexiest thing a woman can wear is a man's wrinkled shirt off the bedroom floor. raulm1961 and HatLoverGirl like this. Quigley you're obsessed with Photoshop! I think one of the most complicated roles in a film was Julie Andrews in 'Victor Victoria'...she's a woman who plays a man who plays a woman...geesh!